(Nanowerk News) A simple method to sense DNA, as well as potential biomarker proteins of cancer or other diseases such as Alzheimer’s, may soon be within reach – thanks to the work of a team of Yokohama National University researchers in Japan. As the team reports in Applied Physics Letters ("Simultaneous detection of refractive index and surface charges in nanolaser biosensors"), they created a photonic crystal nanolaser biosensor capable of detecting the adsorption of biomolecules based on the laser’s wavelength shift. This image shows a top view of the group’s nanolaser, in which the center narrow slot (horizontal line) is the main part of the sensor. 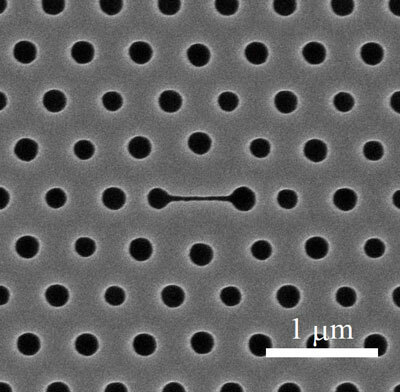 The periodic holes form a photonic crystal, and although the size of the holes appears to fluctuate they’ve been intentionally modified so the laser’s emission is effectively extracted to the top.